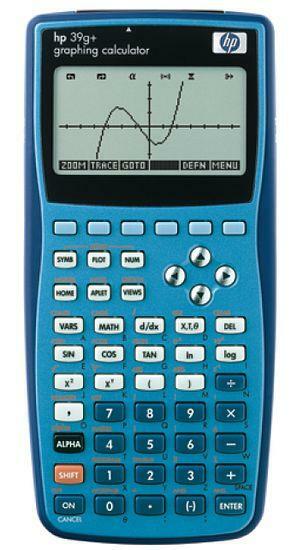 HP 39g+ is the replacement model for the hp 38g/39g Graphing Calculator. Serial cable included. The irDA port allows the hp 39g+ to communicate with another hp 39g+ at high speed. Display size: 131 x 64 pixel. Serial Port: USB for data communication - see HP CONNX3. Power: AAA x 3 + CR2032 x 1 (commonly available from photo shops), auto power OFF in 5 minutes. Dimensions: 184 x 87 x 24 mm. Tagged By: (a) Cost Estimation with Linear Regression, HP Calculator Connectivity Kit (CONNX3) for HP39gs or HP40gs, College Board AP, HP Solve.